We are a leading Manufacturer of copper nameplates from Pune, India. 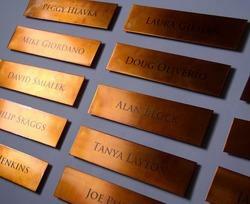 We are one of the leading manufacturers, suppliers, and exporters of a wide array of high-quality Copper Nameplates. These products are commonly used in offices, parties, and homes, owing to their trendy looks and elegant designs. The quality analysts keep a strict supervision over the entire production processes to ensure the conformity to international standards of quality. Looking for Copper Nameplates ?